Under the atheist canon of the Soviet era, New Year was the holiday, with Christmas celebrated unofficially in rural areas only. MP Hanna Herman, PRU: My first New Year costume was that of a comet. MP Alla Alekasndrovska, KPU: I had sweets in my hands, my crown was the shape of a sweet too, and with great delight I was a sweet. Unidentified Orange MP: You’re going to be surprised, but I was nonstandard...um...I was a Ukrainian. Irena Kilchytska, Deputy Mayor of Kyiv: One of the brightest experiences I recall was being a Gypsy. I was in grade three. I neither wanted to be a snowflake nor a bunny. MP Volodymyr Yavorivsky, BYuT: I neither was a bunny nor a runny, nor a wolf. Once we went there, we dressed up: I was Karl Marx I had some book tucked under my arm that had Capital written on it. They fixed me a beard. MP Mykola Tomenko, BYuT: As to an ani…animal outfit, I never appeared in one, as a rule. MP Volodymyr Sivkovych, PRU: Well, I definitely never was a bunny. MP Oleh Zarubinsky, LyB: I was a rabbit, in terms of the Chinese calendar. I have a picture where I’m dressed in a costume, in the white costume of a rabbit. Viktor Yanukovych, opposition leader: There were no fancy toys, no outfits for me to put on. We lived very poorly. Viktor Yushchenko, President of Ukraine: I remember how my mother woke me up early in the morning after New Year when it was time to go caroling, so that I would tour my relatives door-to-door. Happy New Year everyone! Thank you for reading, thank you for lurking, and thank you for commenting:)! I have struggled for your interests and I will keep doing it and I pray for you. I wish you knew how much it costs me. We have a farm but my husband is very ill. People assault on us because of you. As long as my heart beats, I'll stand by you. You will win! In view of this, you and your party comrades should not make any decisions which would contravene your pre-election promises. The President will not dissolve parliament. Even if the parliament is dissolved, your political party can get about 50% of the national vote, provided that the Party of Regions honors its pre-election promises. If your party comrades deviate from their pre-election promises, your party may get less votes. If you abandon formation of the coalition (that is to say by removing communists), you will be definitely crushed. The coalition which was formed should not be reformatted. Anybody who wants may join it. However, any ultimatums, for example, "We will join only if they are removed," are unacceptable. You should follow a firm, tough line with the "orange". They view your compromise steps as weakness. The year 2004 exemplified it. The fact that you won elections means that the Ukrainian people entrusted their future in your hands, and they agree with your program. The main thing is that the law is on your side. And they should not even try to adopt another unlawful decision, similar to the 2004 ruling of the Supreme Court which was not based on any legislative norm. I wish you health and success. Mykhailo, the 8-th year schoolboy from a Tyachiv comprehensive school, addresses you. Back in 2004, during the presidential elections, my family and I were very worried about you. We gave you a lot of support in the run-up for the post of Ukraine's president. I delivered election campaign symbols and wore a blue ribbon on my sleeve. Though it turned out otherwise. My father was sacked – an orange 'plague' came to power. At the moment we are getting ready for the elections again and are anxious about You and the Party of Regions. My friends and I are spreading election campaign symbols again and we are worried about your victory. Every day we wear POR scarves and carry flags on our shoulders. We are canvassing young people for POR, because here is our future. When we win, and I believe in that, I'd like to ask you for help – arranging an animal shelter in our area. This is my dream. I am sure that you will pay attention to my request and I thank you very much indeed. 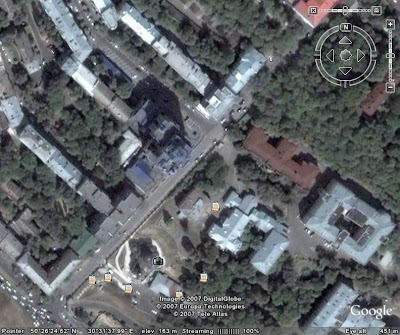 I'm enclosing the photos taken in my room – a ' Yanukovych mini-headquarters'. Рolitics give excitement and agitation of football combined with the elegance and grace of the literature, tough competitiveness and opportunity to find friends worldwide! Dear electors! Sixteen years ago a fate gave us a historical chance – independent sovereign Ukraine. The primordial dream of the Ukrainian people, which was forged in liberation battles for ages become true. The country of Ukrainians stoped to be fata morgana. It is filled up with plans and ambitions of people and politicians to build prosperous and strong country with happy citizen based on the one of the oldest European nation. The interesting thing is, her resume hasn’t been updated. Apparently, in "one of the oldest European nation" some happy citizens' careers can be more dynamic than their Web sites. Girl 1: Would you take us for a ride? Sugar Daddy: Right to the edge of the world! Girl 2: Got enough gas? Serviceman: I’m dying for a glass of water. Could you fix me some, girls? Girl 3: And when do you get home? Serviceman: We’re already at home. We’re in the club every evening after work. Girl 4: What kind of work? Serviceman: Nothing out of the ordinary, work by contract. Girl 5: What kind of contract? You mean a marital contract or what? Sugar Daddy: Girl, girls, girls, don’t you wanna ride? Girls: Go take Granny Manya for a ride, rider! Voiceover: The time for new heroes has come. Contract-based service in the armed forces of Ukraine. If the use of humor in this army recruiting ad was intended to tranquilize the brain, that mission hasn’t been accomplished. You can’t "be all you can be" if you can’t even pay your bills. So, dear advertiser, until you get the financials straight, you’re not fooling anyone but yourself. Tymoshenko: True, there are two parts to an anticorruption audit, or anticorruption probe: it’s what happened before us, and I would like to tell you that it already kind of raises your braid, you know, when you see what’s going on there. Hanna Bezulyk, talk show host: You look just fine, Yulia Volodymyrivna. [In Ukraine, the formal way of addressing people includes a patronymic]. Now that’s a more seasoned sense of humor. Below is a funny fragment from yesterday's televised press conference by President Yushchenko. How do I patch KDE2 under FreeBSD? President Yushchenko: Dear friends, you can get patching help from the programmers at the Secretariat of the President...um...for all of these operating schemes. Plan B, I would suggest that you use new soft…software and don’t mess with your head. Did you see that? This is history in the making! This is the first time I’ve ever seen the President attempting or returning a joke, an overnight sensation for the cyber community. Nice try! Still, I must admit that a mock testimonial for Microsoft Windows would have worked much better. How about I build you a home at a 19th-century burial place of people who perished from anthrax and plague, provided that anthrax spores can live for centuries? In the profit-crazed reality of Kyiv’s construction boom, it’s not a joke. It’s a fact of life — or possibly, death — as this story suggests. The scandal has been gaining momentum over the last week, resulting in a string of articles and forum threads appearing online. Although the building permit had been issued in 2004, under former Mayor Oleksandr Omelchenko, construction proceeded unchallenged under current Mayor Leonid Chernovetsky. However, faced with yet another public relations disaster, as the specter of early mayoral elections closes in, Mayor Chernovetsky ordered that the work be suspended and that the construction site be quarantined for testing and cleanup. Located at Shovkovychna Street, which adjoins the premises of the Central Municipal Hospital, formerly known as the October Hospital, the site belongs in an upscale downtown neighborhood, a plum for any developer. But what if that plum has a viral biological contaminant buried into it? Did the developer have prior knowledge about the cemetery? Aren’t there any historical records? This case warrants a full — and independent — investigation, for anthrax makes no distinction between the rich and poor. Contrary to the woes of the U.S. subprime mortgage crisis and its financial impact worldwide, the bizarre, barbaric, and bubble-like proportions of Kyiv’s housing cartel remain an oasis for speculative capital. Welcome to Kyiv, a city where average salaries run at about $500 a month and yet housing prices rival those found in London and Paris. The profiteer prospers here, while the vast majority of Kyivites have no chance whatsoever of buying a home, given the average life expectancy of 67.7 years. And anthrax doesn’t prolong that expectancy, even if the person has the money to buy a home. Tymoshenko: We once were treating an enterprise. It was Kryvorizhstal. Our treatment worked just fine. Then we treated courts of all circuits. That’s why, by the way, the enterprise is doing fine now. Yanukovych: Where did the money, where did the money go? Tymoshenko: Um…the money...don’t you know [where]? Yanukovych: …the money that the government received. 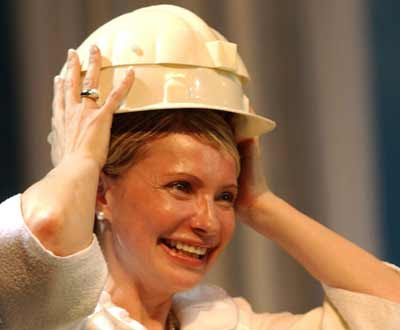 Tymoshenko: Don’t you know it? What a loss for stabilnist! 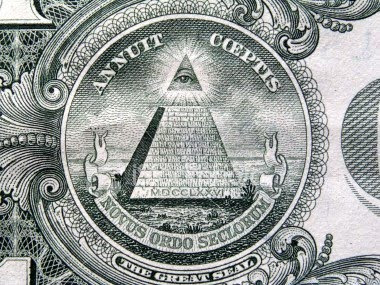 The money was consumed by the people, rather than offshored to some bank on the Cayman Islands. The objectives set before the armed forces will be accomplished. I am finished, and once again I thank you, my President, for your trust. If it comes to making amendments to other legislation — and that includes amendments to the Constitution — we are ready to be full-time partners here with you on this issue. Even though Tymoshenko was speaking with opposition leader Yanukovych, her target audience was obviously President Yushchenko. This love-and-hate triangle makes for interesting communication, doesn’t it? Reporter: Tetyana Chornovil, Obozrevatel. Um…Viktor Fedorovych, the state residence Mezhyhirya, where you still reside, was privatized by a murky firm a few months ago. Could you please tell how it is moral to talk about the sale of state-owned residences in open-bid auctions while doing the privatizing the backdoor way? Yanukovych: ...you meant me perso…me personally? Yanukovych: I would like to tell you, inform you, that if you print unfounded claims, I will sue you. Reporter: Could you please tell what’s unfounded here? Yanukovych: …and will sue you in a court — listen, listen to me carefully — in an international court, which I will specify for you later. What a sad story! In a land of lawlessness, a law-abiding, poor, persecuted, and defamed man like Yanukovych has no hope but to turn to the International Court of Justice, his last line of defense. If we were to have a professional debate, I would cite dozens of arguments that support the rise in combat ability of the armed forces and the systemic nature of changes for the better. But since there is no professional approach, I would limit myself to short rebuttals. Unfortunately, throughout the three years the President neither managed to grasp the army, nor did he manage to grasp the substance and depth of the reform being made. Maybe that explains why the approval ratings of the army are several times the approval ratings of the Commander-in-Chief. I’d put it differently: A president who puts his name on preposterous “social ads” — while keeping his son out of the draft’s reach — does not score high on credibility. The same applies to a president who uses your approval ratings to boost the party’s ticket, and then gives your job to another person, one of controversial voting habits. This guy is a trooper, isn't he? You know that we are law-abiding people, but...um...I recently heard...um...this remark, coming, by the way, from my friends, they tell me...t-t-tell me: “You try to play chess with your opponents, but your opponents take the chessboard and beat you in the head.” That’s why, undoubtedly, we will pay attention to this — we will pay attention — and...um...we believe that any radical actions — they never benefited the state. We’ve always been against radical actions. Any signs of massive head injury? Or should we blame the obvious lack of hematomas on radical use of Max Factor? She’s back. But is she tough enough? Aside from Putin's history class, one of the major events I missed while being out of town was Tymoshenko’s peace voyage to Donbas. In a move highly reminiscent of the maiden voyage she had pulled on the eve of the Dec. 26, 2004 rerun, weeks before being catapulted to her first PM term, she started her second PM term on a soft, conciliatory note. With a stronger personal support and a stronger opposition — both in and outside of the Orange Coalition — she faces a reality very much different from the euphoric landscape of the early 2005. The Orange Revolution is now history, but another presidential election is just a dream away. And there she is, ready to make that dream come true, ready to make history. So, the first thing she does as PM — her suitcase full of presidential ambitions — is beard the lion in his own den. And she seems to have brought some pacifist Kitekat with her, Donbas being a region full of growth opportunities crucial to her nascent presidential campaign. Judging from the soundbites that she spilled down the mineshafts of our minds, she is picking her battles carefully. She demonstrated a willingness to strike a deal with neutral Regionalist factions, a nonaggression modus operandi that would win allies and keep her focused on the coveted presidential prize. We believe that the Zasyadka Mine should not be closed. Instead, it should be developed, using sophisticated safety systems. We are to build a system of quality control in support of the safety system that will never again allow for such tragedies. Despite grave violations of the leasing agreement, we can’t just shoot from the hip. It is necessary to carefully sort out things, and only then should we make decisions. I want to uncover every fact, every detail. In the next couple of days, I will set up a working group answerable to the Vice-Premier that will work on the legislation. We will conduct a full-scale checkup of how the mine equipment was procured, of what funding was used in the procurements, and of how, basically, all the cash flows are moving. We will not leave anything unchecked. We will set up a special housing commission that will analyze the living conditions of each of you. After a while, once we’ve put in some work, we’ll meet in the same arrangement as now, perhaps as soon as a month from now. We need to do things. Whoever wants to keep on struggling, let them struggle. I want to do practical things and bring order to the country, so let elections be on someone else’s mind. We’ll be working further, and will make it so that being a miner in our country will be fancied by youths and children. Just how many Cabinet members’ kids will want to become miners? Is she absolutely positively sure those safety systems will work? If methane buildup indeed happens to be the case, should we burn off the gas, or should we burn off the miners’ lives? As long as these questions remain unanswered, they beg the question of whether the Prime Minister should endear herself to the miners at the cost of endangering their lives. Meanwhile, PM Tymoshenko appears to have quietly abandoned her widely publicized campaign promise of abolishing conscription as early as 2008. Her burying the hatchet on this issue can be seen as an attempt to lessen friction with the slow-paced NUNS coalition partners, who control the military. For people on the front lines, the status quo comes at a high price. A conscript died recently in a bullying incident, followed by the death of another miner at the Zasyadka Mine. When you try to be all things to all people, you may eventually become president, but more people may die along the way. In a surprise move, President Viktor Yushchenko today appointed MP Raisa Bohatyryova, PRU, to serve as Secretary of the National Security and Defense Council. The appointment of a high-profile opposition figure to a key government post — a political maneuver rarely seen in the rest of the world — blurs distinctions between government and opposition. It gives a new meaning to the give and take of Ukrainian politics, and expands the boundaries of consciousness. Yanukovych has frowned on the act, something he did literally at a press conference on Monday, when asked about his housing privileges. Serhiy Leshchenko of Ukrayinska Pravda views Bohatyryova's promotion as a multipronged stratagem to engage Tymoshenko in a tug of war and drive a wedge in the Party of Regions. Agreed, playing two ladies off against each other can be fun, but what if they start playing against you? What if the hunter becomes the hunted? In a 226-224 vote, the minimum required majority, the Orange Coalition today confirmed Yulia Tymoshenko's nomination for the post of Prime Minister of Ukraine. The opposition refused to participate. MP Yuriy Yekhanurov, NUNS, who was considered an undecided, stole a round of applause for saying yes. MP Ivan Plyushch, NUNS, a proponent of the Grand Coalition, abstained. MP Ivan Spodarenko, NUNS, was absent. In his bilious valedictory speech, outgoing PM Viktor Yanukovych predicted that the Orange Coalition will deepen instability and wreck the economy. The promise of better living will not be realized, he said. In an apparent attempt to project a sense of relief, he wished Tymoshenko good luck, saying "it feels good to lay responsibility" for what is going on in the country. The Party of Regions will be in the opposition, and will stand on guard against populism and efforts to destroy the economy, Yanukovych concluded. P.S. Goodbye Yanuk! Don't forget to take stabilnist with you. In Odesa, there’s a 10-storied building that was grabbed by a deputy from a “democratic” faction. He makes these threats, “I’ve bought all the courts. You won’t win anything. You’re a nobody, because I’m a deputy.” And you know, there are thousands of cases like this. A whole system is at work here: prosecutors, courts, the High Council of Justice. This is evil, and nothing will stop me from abolishing it. Amen to that, Mr. President. Of course, a close and native Ukraine; of course, a dazzling Tymoshenko; but on the other hand here in Russia they don’t fear hardline politics. 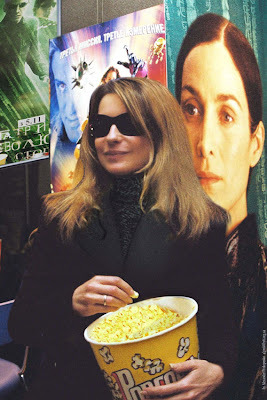 We, by the way, are not afraid to come into conflict even with the Americans, let alone with Yulia Tymoshenko. Do not overestimate your self-importance, dear colleagues. That’s one hell of a hierarchy, with that “close and native” Ukraine lying at the bottom and those Kremlin bravehearts stuck somewhere between the rags and riches, right? The mind boggles at how much wing clipping must be done to have our government work for our people, and not the other way around. The SBU on Friday interrogated Minister of Transport and Communication Mykola Rudkovsky, a scandal-scarred member of the outgoing — hopefully — Yanukovych Cabinet. The investigation concerns a round-trip private jet flight to Paris on Jun. 9 through Jun. 12, paid for by the government, on which Rudkovsky, according to Tabloid (Ukr), was accompanied by Oleksandra Nikolayenko, Miss Ukraine 2001. Rudkovsky, who argues that the trip was part of an official visit, said that in the event it is established that an unauthorized person was on board, their airfare should be paid. This wrathful reaction can be attributed to my principled position and to the efficiency of my work, while the flight itself was part of a state visit, which is supported by the submitted documents. I would also like to state that throughout my term of office I have personally paid for a number of job-related trips, and I do not demand a reimbursement for these expenses. 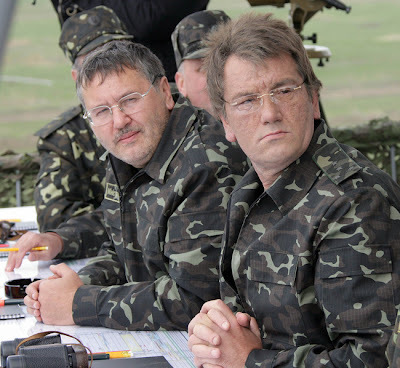 Consider Yuriy Lutsenko — took more than ten trips with his family to Crimea. Consider Arseniy Yatsenyuk — paid for his trips from the budget and from the ministry's funds. I, as a Minister, know how much flying is done by the Chief of the Presidential Secretariat, by members of the Presidential Secretariat, and by the [President's] family. If Mr. acting SBU Director is interested in my personal life, he'd better assume a position under my bed. Not much will be seen from there, but the hearing will be fine. 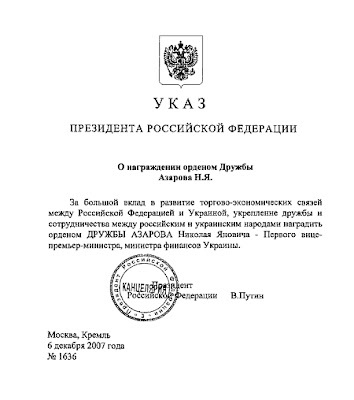 For distinguished contribution to the development of trade and economic relations between the Russian Federation and Ukraine, for strengthening friendship and cooperation between the Russian and Ukrainian peoples, may the ORDER OF FRIENDSHIP be granted to AZAROV Nikolai Yanovich, First Vice-Premier and Finance Minister of Ukraine. Trading honors and awards is a popular ego-boosting sport among the post-Soviet elites. Sometimes it’s grandiose, as in Azarov’s case. Other times it’s gross, as in Potebenko’s case. 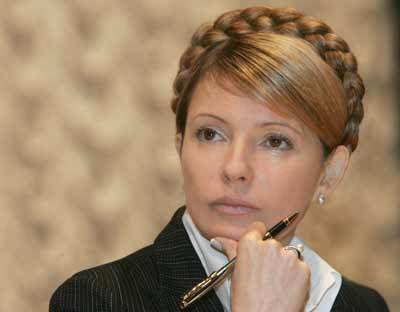 The new date for the Tymoshenko revote is Tuesday, Dec. 18, Ukrayinska Pravda (Ukr) reports. Having extorted the Orange Coalition for an extra couple of parliamentary committees, the would-be opposition has agreed to a roll call revote. But given the fresh history of false starts, is this the final countdown? That question remains to be answered. Stoyan: Once you’re in jail, we’ll be making arrangements to have you awarded with a medal of honor. Stoyan: Okay, you’re a modest person. You ordered three pieces of dried crust. As head of the Rada Labor Union, I will arrange it for you. But you also ordered a bottle of beer. Ukraine is being protected by God and…um…all of our history suggests this, despite the fact that we don’t always behave in God’s ways, all of us. But even today God is giving us a sign. And if the President of Ukraine is a believer, a true and devout believer, then he can’t just sleep quietly through this night. He must understand that if the people do not understand that a destructive force like Tymoshenko must not be allowed to gain power, then God steps in. This event that took place during the voting today suggests that nature and God do not want us to let this mistake happen. Inna Bohoslovska is a lawyer and a member of the Party of Regions. See that guy standing next to Speaker Yatsenyuk? Watch his hands. Why call him 'Meteorite Man?' Watch the astronomical video. Is that Orbit Radafresh or Orbit Orangefree? Following the President’s renomination of Yulia Tymoshenko to the post of Prime Minister, members of the Party of Regions have blockaded the rostrum of the Verkhovna Rada, preventing it from meeting in session. This move, according to BYuT MP Oleksandr Turchynov, breaches an agreement reached on Tuesday that evenly divided the parliamentary committees between the Orange Coalition and the would-be opposition, with each side claiming 14 committees. The Regionalists are now also demanding an apology for being accused of sabotage, an allegation they have vehemently denied. The Rada is expected to reconvene at 4 p.m. Kyiv time for a possible Tymoshenko revote. Yatsenyuk: In the event of a roll call vote, I see no possibility for Yulia Tymoshenko not to become Prime Minister. Interviewer: And what if Yulia Tymoshenko is not elected Prime Minister, will you quietly lay down your Speaker’s — what should I call it — mandate, and, bluntly put, will you resign from the Head of the Verkhovna Rada post? Yatsenyuk: I guess that will be the right thing to do. MP Oleksandr Omelchenko, NUNS, who is the former mayor of Kyiv, reportedly failed to use his voting card. During the vote on a re-vote, which resulted in the same number — 225, against the required 226 — Speaker Arseniy Yatsenyuk had his voting card snatched from him by MP Vladyslav Lukyanov, PRU. This member of the Party of Regions is known for discounting the Orange Coalition's chances by comparing them to the possibility of the Earth's collision with a large meteorite. The Rada has adjourned until 5 p.m. Kyiv time, as required by the rules of order. The re-vote will take place following the President's repeat nomination of Yulia Tymoshenko for PM. 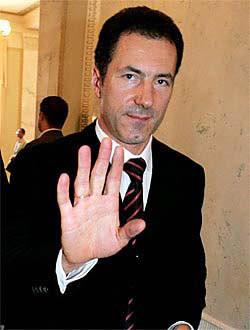 To eliminate opportunities for fraud, the Orange Coalition demands that the re-vote be done outside the computerized Rada voting system. According to NUNS leader Yuriy Lutsenko, a more elaborate plot was at work, which exploited a weakness in the system. The SBU is investigating the matter. Speaker Yatsenyuk has pressed charges against Lukyanov. According to BYuT MP Andriy Shkil, if found guilty, Lukyanov can face up to three years of imprisonment. Prosecution appears problematic, though, as no members of the Party of Regions or the Cabinet have been prosecuted by the current Prosecutor-General, despite several high-profile investigations by law enforcement. This week, we celebrate a great victory for academic Ukraine. Whew! He did it! What a relief for Montesquieu fans. 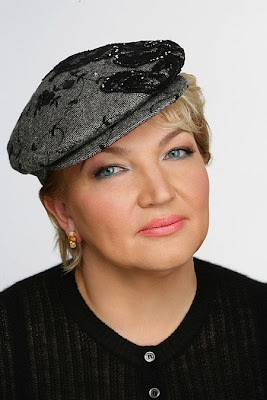 Another exercise or two, and the legendary “Anna Akhmetova” may become a distant memory. Below is an interview fragment in which a female reporter questions MP Volodymyr Sivkovych, PRU, about his role in one of the infamous videos released by BYuT. Reporter: So did you say that? Do you remember where that was? Sivkovych: Yes, here it is, Maryinsky Park, with a view toward that…this construction being…um…constructed, the scandal-scarred one. Reporter: So what did you talk about there? Whom did you talk with? What about? Reporter: What did you talk about? Reporter: And what, did you offer him money? Sivkovych: Are you sick? Where’s the money in all of this? Well, I'll tell you that you know me as a person that…who basically has everything…um… [long pause, Yatsenyuk bursts into laughter] …who had everything…um…the way he…I planned. And I dread at...um...the sight of what…um…we have in our district administrations [refers to municipal subdivisions]. Well, most Kyivites also dread at the sight of what they have further up the chain. On Tuesday, Dec. 11, the Verkhovna Rada will pass a vote on Yulia Tymoshenko, nominated by President Viktor Yushchenko for the post of Prime Minister. "This is a clear requirement of law and rules of order," Speaker Arseniy Yatsenyuk stated today. As the crucial vote approaches, suspicions of sabotage from the would-be opposition led by acting PM Viktor Yanukovych have intensified. Confronted with a hostile environment and a razor-thin vote margin, the Orange Coalition is offering the would-be opposition a cornucopia of political pacifiers, including the First Vice-Speaker post and control over key parliamentary committees. In the event Tymoshenko fails to gain a majority, her failed wedding may become a choke point for the Orange Coalition, a scenario very much desired by her arch-rivals. Miner 1: What do I do? Guys, you tell me. What do I do at home? Where’s my Roman? Where? I want…I want to know where Roman is. He went off to work. Mother’s waiting for her son. I'm waiting, too. Where is he? Why holler? [shrugs off a man trying to calm him] And what should I do? Please understand, I only have one [son]. I won’t have another one. Brother, there won’t be another one. That’s it. I had hope, I had support. Now I d-o-n-’t! And what am I supposed to do? Maybe I should treat you to bread and salt? Where’s this Yushchenko? Where are they? Have they arrived? Let them explain. I’ve lost my son! He didn’t fool around. He didn’t throw around hundreds of dollars [refers to college bribery]. No he didn’t. He honestly worked together with you guys here, at Section 7. He did honest and good work. He’s no loafer. Because I’m no loafer. I did 20 years of work. Look at these hands here! Look here! The gas level at their drift ran at 80 percent. Everybody came running. I say it’s an unhealthy situation. Get out of there! Yeah, he promised me, he promised. He lied, he lied! Now let him come out. Let him look the people in the eye. Let him look! [probably refers to the man who controls the mine]. It’s in mines like yours — in high-methane ones — that not a single cable should be pegged. And how many pegs do you have on those cables? How many? How many jumpers do you have on those indicators? Plan! Plan! It’s unachievable for such depths and…it’s unachievable! Other miners: Guys, we work here at the Zasyadka Mine. What should we do? Miner 1: Jail him, jail him! Think of all the lives he destroyed! Other miners: No one will jail him. No one will jail him. Miner 2: I was in ICU. He’s telling the right thing, guys. I was in ICU. They brought me a small TV, they showed me: an explosion at Zasyadka, a government commission is conducting a probe. And they said a trolley exploded at a mine horizon. How could a tram explode at a mine horizon? That particular trolley, I hereby report to you — I’ll show you my ID, here’s my ID [states his name]. I was in delivery. On May 24, 1999 I was told to leave the tram. It’s remains there to this day. Don’t fool us. He’s telling the right thing, this man. I quite agree with him. I share his views. By the way, I now would like to…[struggles to speak] ever since, my nerves are not OK. You can check my ID. I’m not hiding. This is where I work. I work at the SEA, or Sanitary-Ecological Area. I was assigned here in 1990. Pechersk School International, an elite English-speaking institution attended by President Yushchenko’s two younger daughters, has become the epicenter of a scandal. What attracted public attention is the controversial role-playing assignment given in a history class. 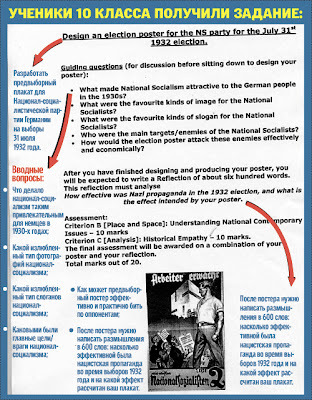 The object of the assignment was to generate the tyrannic profile of Hitler and to grasp the mechanics behind the Nazi election campaign. 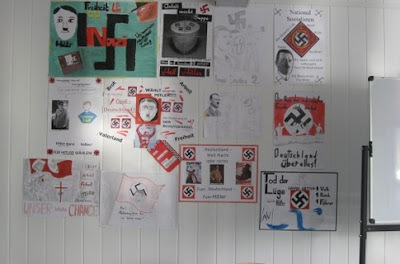 For several days, students experimented with Nazi propaganda by drawing paintings of Hitler and replicating the slogans of the Third Reich. Initially, the PTA defended the assignment as one that in no way makes Nazism itself part of the official school policy, which, on the contrary, includes school trips to Holocaust museums. However, at least one family protested the assignment and withdrew their child from the school attended by the offspring of Kyiv’s diplomatic corps and expat community. Kateryna Yushchenko is convinced that placing demands on adolescents to recreate fascist symbols is absolutely unacceptable, regardless of all educational designs. It is particularly unacceptable in a country that suffered most from the horror of fascism and communism. Even though the children of the Yushchenko family, who study at lower grades, did not attend this class, Kateryna Yushchenko is categorically against their viewing of posters depicting any totalitarian symbols. The First Lady makes good sense. In a country that lost 7 million lives to the Third Reich — unlike any Western country — Hitler must not be approached with a detached attitude. The fathers of both Viktor and Kateryna Yushchenko went through Nazi concentration camps. Role-playing games can be an effective vehicle for learning, unless they equip the mindset of a young person with a carefree picture of crimes against humanity. The state of the world makes the study of history crucial to the survival of humankind. The study of history, in turn, requires a high degree of sensitivity. A school assignment that brings together kids of diverse ethnic and cultural backgrounds should have sensitivity factored into it. What Student/Parent A finds acceptable, Student/Parent B may not. Indeed, one’s freedom stops where someone else’s begins. And it appears that the ethical concerns in this assignment do outweigh, if not rule out, the pedagogical value of the assignment. In the Slisarenko scandal of three months ago, The Kyiv Post published an editorial chiding President Yushchenko for shipping his children off to an elite school rather than taking on the severely underfinanced public school system. Students were tasked with finding out how in Germany, in a democratic state, a tyrant could come to power. The Director believes that the teacher’s goal was to denounce fascism. The commission’s probe is pending. In case the fact of fascist propaganda in a history class at Pechersk School International is confirmed, I will contact the Security Service of Ukraine and the Ministry of Foreign Affairs with a request that the history teacher be deported from the country. In all likelihood, to accuse the teacher of propaganda is to turn the issue on its head. What happened was an unfortunate ethical misstep that should supply the material for a case study. The first report on the incident was published in Segodnya (Today), allegedly controlled by Rinat Akhmetov, a member of the Party of Regions opposed to the Orange Coalition.